I’ve been working hard at learning to knit this year. My first lessons were in April and I’ve working on cowls, some lace, shawls and hyperbolic crochet (for the Washington DC area Coral Reef Project at the Smithsonian). This is my first sweater. I’m very proud of it, the pattern is the Gathered Cable Pullover and it’s sold through Interweave. 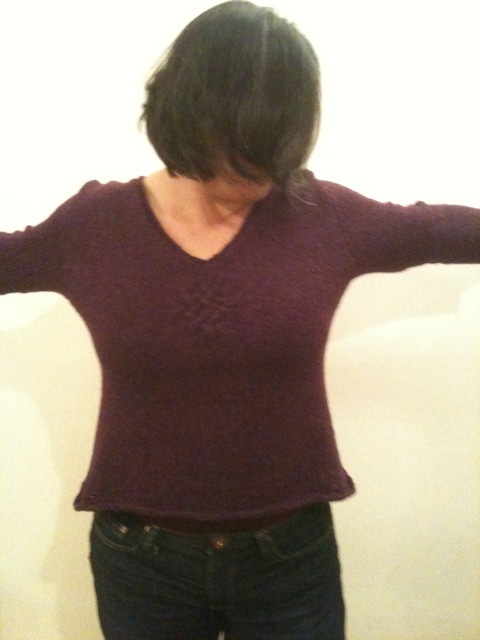 I used Silky Wool which feels like a washed t-shirt after it’s been blocked and washed. Very very nice! This entry was posted in Art, Knitting, Life. Bookmark the permalink. truly beautiful….but can’t see the great detail in the front (those crossing over things). I know cause I saw the real thing. cowl? cow? I don’t know…. You should knit a wild woman sweater next!! Wonder who would wear that one! Mongoose=Wild Woman…..I mean that in a good way. Terry, cowls are great because they take one skein, so you can use lovely yarn.